Who remembers last week when I shared a video of myself talking about my accent? Well, if you don’t remember, please go watch it! Are you back? OK, now it’s your turn! 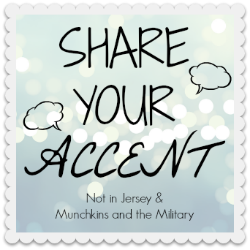 With the help of my friend Alex at Munchkins and the Military, I’m excited to bring you a link up where you can share your videos of your results of this accent quiz. Take a button, put it on your post, and link it up below!! 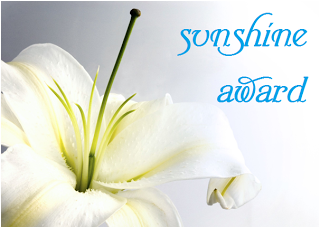 Speaking of Alex, this week she nominated me for a Sunshine Award! Wow! I am answering the questions that Alex asked me today! 1. What person in your life do you most look up to? The answer to this has changed as I grew up and changed who I am and what I thought of myself and what I wanted to be. Right now, I look up to many of my friends because of the ways they live their lives, parent, help others, and are good friends! This is a variety of people, not just one person. 2. Did you have a favorite subject in school and why was it your favorite? My favorite subject was always English because I always loved to read and write. 3. Who is one person you’d like to switch places with for a day. I would like to switch places with my husband. Not that I’d know how to do his job, but maybe we’d learn more about each other if we switched places for a day. 4. How did you parents choose your name? My dad found it in a name book while my mom was trying on maternity clothes. They were looking for a name that started with D. Come back later today for more about names!! 5. Do you have a favorite holiday? Why? My favorite holiday is Sukkot, the one that just passed. It’s a lovely fall celebration that I always enjoy with my family and friends. My phone. (Except for on Saturdays). 7. Are you team iPhone or Android? 8. What is one place in the world that you’d like to visit? Next on my travel wishlist is Utah or Montana. Although I really really want to go on a Disney Cruise, so I’ll say the Caribbean! 9. If you significant other was on trial for something serious, would you lie to protect them? 10. Do you have a favorite YouTube video? Share the link! Aside from the one linked above of me sharing my accent? Just kidding. I’ll go with Ya’lili, The Official Music Video. My kids have loved this song for years and it’s just a lot of fun! Ok, now that you know a little more about me…don’t forget to record yourself taking the accent quiz and link up above!